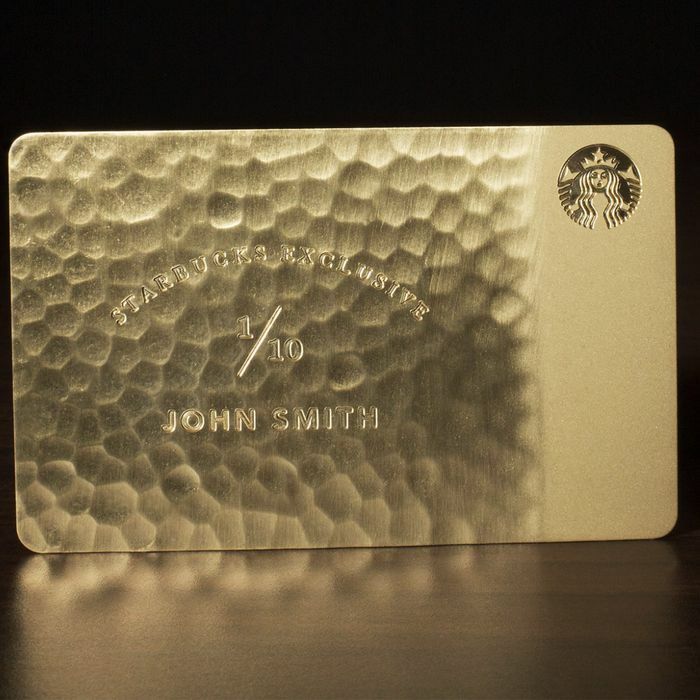 Here’s a nugget of wonderful news for those who thought Starbucks came off a little stingy when it announced a holiday deal called “Starbucks for Life” that was really a sweepstakes for 30 years of free coffee for ten lucky Starbucks cardholders: That perk now comes on a $5,000 card made of 10-karat hammered gold that almost literally screams, “I trump all other cards,” no matter how much assayable metal they may contain. Eligibility is now open until January 5 for those who partake in the chain’s app, or are packing a humdrum Starbucks Card. In addition to the ten lucky Americans, three Canadians and one person from the U.K. will win one. By next year, all fourteen of them will no doubt be exchanging sad emails about what it’s like carrying a hefty piece of gold on a daily basis just to get their morning coffee. There are other prizes, too; several folks will win Chestnut Praline Lattes, but you can’t really use those as currency to board a plane in an emergency during the gerbil zombie apocalypse.